The village of Kafr Qaddum in the district of Nablus is particularly badly affected by the Israeli occupation and its apartheid system. The illegal Israeli settlement of Qedumin was established nearby in 1974 and its more recent expansion cut off the villagers’ main road to the main town of Nablus in 2003. 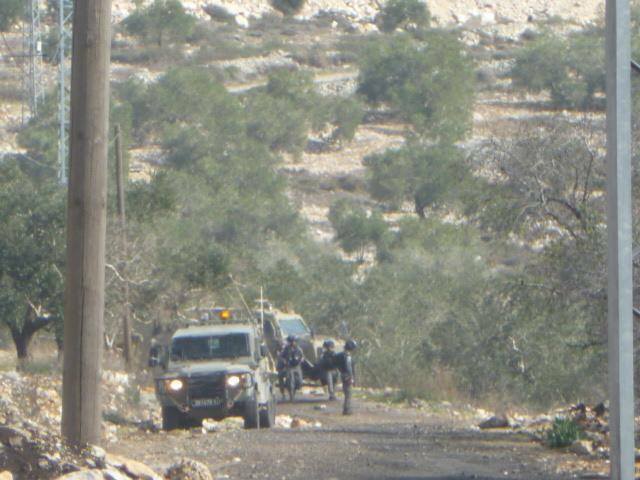 This forces all Palestinians, even ambulances, to take a very long detour to reach the town. Since 2011 a weekly demonstration against the road and the occupation takes place in the village, often with very violent attacks by the Israeli army. Resistance, as is the case all over the West Bank, is met with collective punishment and terror. Most villagers are olive farmers, and depend on the harvest as their main income. Olive trees also have a deeply symbolic value and are an integral part of Palestinians’ life. This provides Israel with a particular target in their continued oppression of Palestine. For example, in mid October this year the Israeli occupation army burned down 100 trees, giving no reason or explanation. When the villagers attempted to put the fires out, soldiers fired teargas at them. The olive groves close to the illegal settlement are located in Area C (an area of approximately 3000 acres) and are under full Israeli control. They stretch to west and the east from Kafr Qaddum with around 15,000 trees owned by around 80-90 families. As in many other areas of the West Bank, the farms are off limits to farmers for most of the year and they are only allowed access with Israeli issued permits during the olive harvest. The army have also closed agricultural roads leading to the fields forcing Palestinian farmers to access them only by foot. Olives have to be transported back to the village using donkeys. This year, in the area west of the village, which is twice the size of the eastern area, farmers were granted permits by Israel to pick for six days. Six days for 10,000 trees meant only 60% of the olives were picked, at a significant economic loss to the farmers. In the eastern area two days permission was given, but farmers were unable to harvest on one day due to bad weather. This meant only 20% of the olives were picked there. Every year, at least 50% of the olives do not get picked. Naturally, farmers bring as many olive pickers as they can to finish the job quickly, but non-family members were refused by the soldiers to help- due to not being owners of the land. In fact soldiers responded with bullets and stun grenades if anyone tried. Any farmer who invited international volunteers to pick (volunteers who also report on human rights abuses) was punished by being prohibited to pick their olives at all. Very short day permits were granted (8.30am to 3pm), and on some occasions the army put a stop to the work at 12pm, without providing any justification for doing so. Not only are the farmers under pressure to harvest their olives in a very short space of time, their permits are never on consecutive days, nor are they on Fridays and Saturdays when children are off school and parents off work. It makes it incredibly difficult to organise well and finish the job. The Israeli army is also a constant threatening presence, overlooking the groves. Farmers were made to specify which area they would pick on the day, and were not allowed to go anywhere else. This provided illegal settlers from Qedumin an opportunity to pick and steal olives from the other groves with no interference from the army, who would watch. The village council also report thefts of equipment from the groves such as ladders, saws and secateurs, as well as cooking pots and pans, and on occasion bags of picked olives. Settlers have cut down olive trees, and on one occasion an armed settler approached farmers and threatened to kill them unless they left. Year after year Israeli settlers and army do their utmost to disrupt and destroy the harvest to force Palestinians off their land and push them into poverty. Poverty is an increasing problem in the village as incomes plummet, with few opportunities to find other work. In an incredibly manipulating move, the Israeli Government offered young men in the village permits to work in Israel if they stopped resisting the occupation and not attend the weekly demonstration. The opportunity to make a considerate amount of money may seem tempting, but the young people of Kafr Qaddum are not so easily swayed. They know there is no price on freedom and no one has taken the offer up. And so villagers are continuously punished for their activism and vocal opposition to the occupation. Checkpoints are often set up around the village and villagers interrogated. 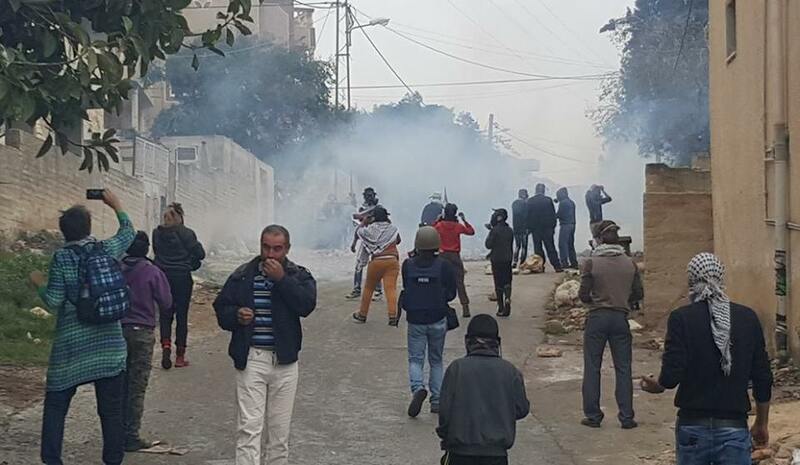 The army regularly blows the electricity installations by spraying them with the skunk water frequently used at the weekly demonstration, and illegal settlers also cut electrical wires and water pipes located inside the settlement, creating power cuts in Kafr Qaddum for up two days. Since the demonstrations started in 2011, 150 arrests have been made after demonstrations in the village of 4,000 inhabitants. Currently 12 young people are in prison and in the last few months many young people have been injured by rubber coated steel bullets: a 17 year old boy was shot in the head (immediately arrested and released after paying a huge fine); two girls of 5 and 7 were shot not long after and a soldier aimed straight at a 16 year old boy at close range taking his eye out. A boy of 18 had a teargas canister fired straight at him that hit his head, and he can now no longer speak. Many children in the village also suffer breathing problems from regular teargas attacks. In addition to this, 77 people have been injured by live ammunition at these protests. The disruption at the olive harvest in Kafr Qaddum is clearly a strategy to make it near impossible for people to live there and survive. The humiliation, oppression and terror that come with the occupation are another way of making life for Palestinians unbearable. But still, every Friday and Saturday they come out to protest, and every autumn they go to their fields to harvest what olives they can. This is their land and, Inshallah, they will get it back.